The Cozbys Erica, Chance, Catcher and Campbell flank champion Rickie Fowler and agent Sam MacNaughton. As tournament director for the Thunderbirds of the recent Waste Management Phoenix Open, Chance Cozby had a year to implement changes, some very noticeable and others hidden from view, that had a positive impact on one of the PGA Tour’s best known and most successful events. 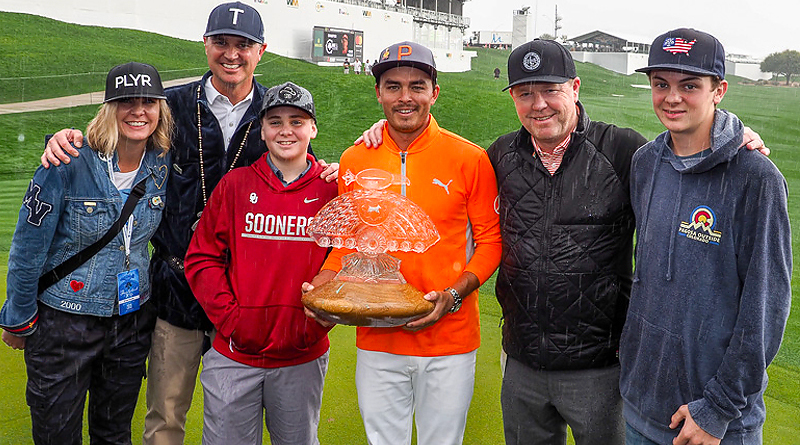 Cozby, youngest son of Oklahoma Golf Hall of Fame inductee Jerry Cozby of Bartlesville and the head of player development for Ping, dedicated much of the past year to working on the tournament, culminated when Rickie Fowler gave up a huge lead then bounced back to win on a cool, rainy Sunday. Like his brothers Cary and Craig, Chance attended and played for the University of Oklahoma, but is a long-time friend of Fowler’s agent Sam MacNaughton, a Houston native who attended Oklahoma State and got to know Chance when he worked for Ping in Phoenix following college. MacNaughton left Ping to work on Steve Largent’s unsuccessful bid for Oklahoma governor in 2002, then became a sports agent, landing Fowler and representing him since he turned professional in 2009. 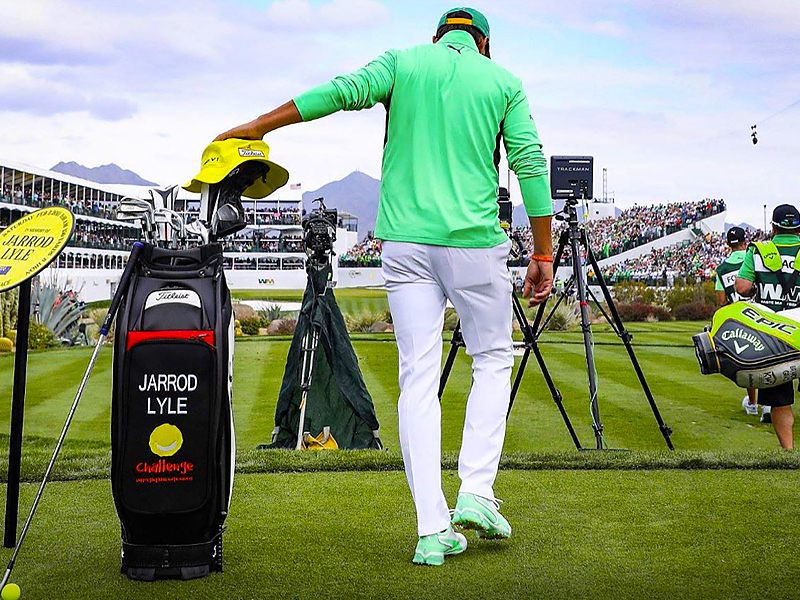 Rickie Fowler pays his respects to Jarrod Lyle, who passed away in 2018. “Rickie has a great past with the Phoenix Open,” Cozby said. “We first gave him a sponsor’s exemption 11 years ago when he was in college, and he’s supported the event ever since. He’s had a couple of very notable second-place finishes and we’re thrilled to have him as our champion. 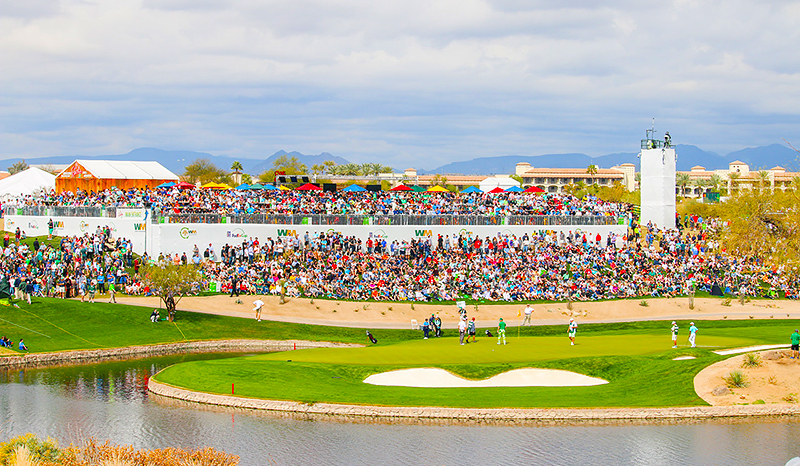 Some of the changes Cozby implemented have to do with the sheer size, scope and reputation as a party venue unlike any other that the Phoenix Open has justifiably earned. He beefed up uniformed police presence not just on the par-3 16th hole but throughout the venue. Cozby had a uniformed office walk with every group and there was a zero tolerance policy for heckling or rowdy misbehavior. He said the reaction from players and agents was overwhelmingly positive. The new El Rancho venue was installed by the 12th hole under Cozby’s leadership. Cozby also earned praise from the tour caddies, letting them take over the golf shop at the TPC Scottsdale clubhouse where they received the same level of food and service as the players. A new 18,000 square foot venue was built to the right of the 12th hole called El Rancho, aiming to get more of the stadium atmosphere deeper into the course. The hospitality venues on the 18th hole were also completely revamped. 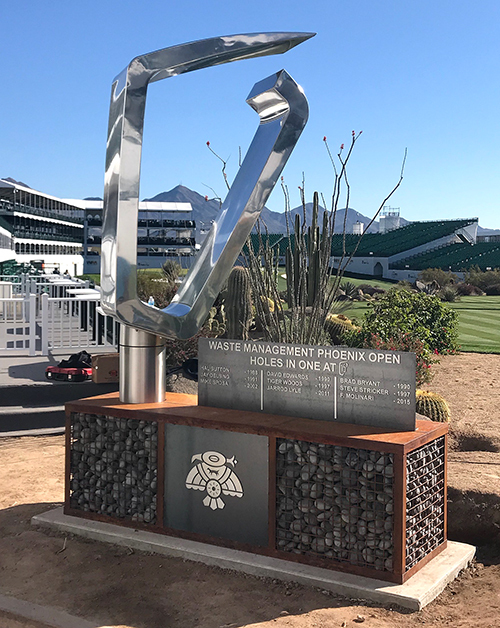 A new monument was also built on 16 to commemorate every hole in one hit there. Two events that were especially meaningful to Cozby both occurred on the famous and somewhat notorious 16th. Hole-in-ones on the par-3 16th will now be permanently commemorated. On Saturday there was a tribute to Jarrod Lyle, the Australian golfer who died of leukemia at the age of 36 last summer and made a hole-in-one on 16 in 2011. A replica of Lyle’s bag and the 8-iron he used for the ace were on the tee along with his signature yellow hat. On Wednesday, Gary Woodland invited Amy Bockerstette to play the hole with him in a practice round. In a touching moment that went viral on the internet, the first collegiate golfer with Down Syndrome made a par, hitting her tee shot in the bunker, blasting out to eight feet and rolling in the putt. This year Cozby transitions into the roll of The Big Chief with the Thunderbirds, more of a advice and supervisory position that will allow him more time for his post with Ping. One final change Cozby implemented was not to release attendance figures for the WMPO. The amount the event raises for charity will be released when it is tabulated in a few weeks. The job done by the Thunderbirds and the Waste Management folks in making this event unique is certainly not lost on the PGA Tour. In an early week visit, PGA Tour Commissioner Jay Monhahan heaped on the praise. 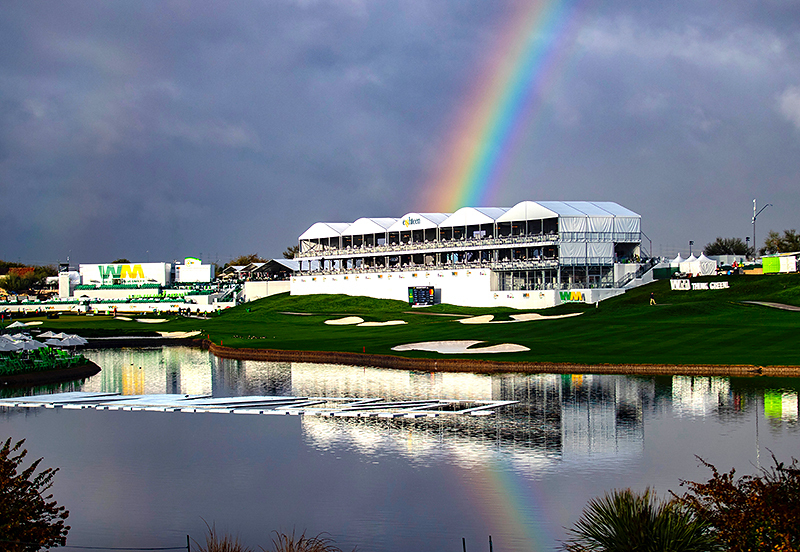 The new corporate venue on the 18th hole adorned with a rainbow shortly after the conclusion of the 2019 WMPO.